Go Ape is encouraging Scots to live life adventurously by swinging through the tree-tops amidst some of the country’s most stunning scenery this summer. 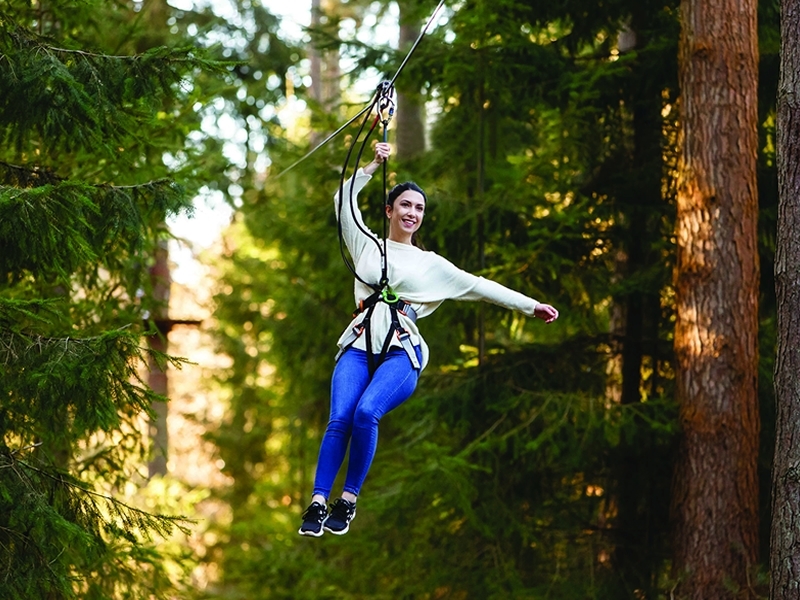 Go Ape Tree Top Adventure is encouraging Scots to live life adventurously by swinging through the tree-tops amidst some of the country’s most stunning scenery this summer. With high speed zips, free-fall Tarzan swings and daring crossings, Go Ape offers the ultimate challenge and the perfect opportunity to grab your Tribe and head outdoors for a spot of summer sun amongst some of the country’s most breathtaking scenery. For those looking to live life to the full with their Tribe this summer there are three unique Go Ape Tree Top Adventure courses located across Scotland, including Queen Elizabeth Forest Park in Aberfoyle, Glentress Forest in Peebles and Crathes in Aberdeenshire. Adventurers can expect to be taken on an exciting journey while also getting a fun workout with the average visit burning anywhere up to 600 calories. The courses are open to those 10 years and up and is the ideal adventure for people of all ages, with a centenarian even taking to the trees earlier this year. • Go Ape in Queen Elizabeth Park in Aberfoyle also provides the challenge of testing yourself on two of Britain’s longest zip wires, each stretching over 400m long, flying people 150 feet above the ground and over a 90-foot waterfall. • Go Ape Peebles is built on the hillside within the striking Glentress Forest and takes advantage of the valley for some jaw-dropping exposure and challenges the laws of gravity with the highest zip wire in the country, located above a magnificent reservoir. • Go Ape Crathes Castle in Aberdeenshire is located in the landmark grounds of the castle. With turrets and towers, winding staircases and ancient sculpted yew trees; historic Crathes Castle’s 595 acre estate offers a fantastic day out. Go Ape is also challenging adventurers to gather their tribe and share images of their Go Ape experience this June using #ThisIsMyTribe for the chance to win the ultimate road trip with O'Connors Campers - https://goape.co.uk/competitions/this-is-my-tribe/ - entries are open until the end of June 2018. Go Ape prices range from £33 for a gorilla (aged 16 and over) to £25 for a baboon (aged 10 to 15). To celebrate summer, Go Ape is running a number of promotional offers.